Please note – the Safer Seas Service App is undergoing essential maintenance. We aim to provide you with an excellent new App ready for 2019. Real-time information will continue to be available via the Interactive Map. The Safer Seas Service is the only national real-time water quality service that protects all water users from pollution. This pioneering free service alerts water users when sewer overflows discharge untreated human sewage into the sea and when water quality is reduced by diffuse pollution at 333 beaches across England and Wales. The Safer Seas Service is the first and only national service to inform you, in real time, when untreated human sewage and diffuse pollution is impacting water quality at your favourite beach. This information keeps you safe, allowing you to make an informed decision about how, when and where you use the sea. Untreated sewage and wastewater frequently discharges from sewer overflows right around the UK, sometimes significantly reducing water quality. When this reaches dangerous levels, SAS is notified by participating water companies and issues a real-time sewage alert so surfers and other beach users can avoid this potentially harmful pollution incident. Water quality can also be reduced by diffuse pollution, which is the term given to pollution from multiple, often unidentified sources. Examples include road, urban and agricultural run-off and leakage from septic tanks. Contaminants can include pathogens, hydrocarbons, heavy metals and organic substances. When these sources combine, they can often have a significant impact on water quality. The Environment Agency make daily predictions relating to the impacts of diffuse pollution. The Safer Seas Service reports these daily predictions, both for good and poor water quality, in real- time and for free. During the 2017 bathing season the Safer Seas Service issued 353,329 free, real-time messages warning users of reduced water quality. These warnings are vital as there are serious illnesses associated with using polluted waters. Whilst the Safer Seas Service is an effective tool in allowing water users to make the most informed decision about how, when and where they use the sea, it’s not a solution to address the underlying causes of these all too frequent sewage pollution incidents. A review of how the UK implements the Bathing Water Directive, ensuring bathing water quality is tested at the appropriate time and in the appropriate place, thus protecting the bathers, surfers and water users most at risk. Increasing water company obligations to introduce more effective and faster investment to remove current sewer overflow assets with priority awarded to sensitive areas such as bathing waters, recreational watersports zones and Sites of Special Surfing Interest. Mandatory year-round sewer overflow warnings introduced for all affected UK beaches regularly used by the public to protect public heath where the current water quality-testing regime fails to. A strict, legally binding limit of 3 sewer overflow discharges per season, per sewer overflow asset. Discharges should only be acceptable in extreme weather events. A ban on water companies installing all new sewer overflow assets directly impacting areas of the coastline important for public recreation or other environmentally sensitive areas. SAS’s free Safer Seas Service is this summer’s must have beach accessory and is available as a web-based map, issuing pollution warnings for 333 popular UK beaches. 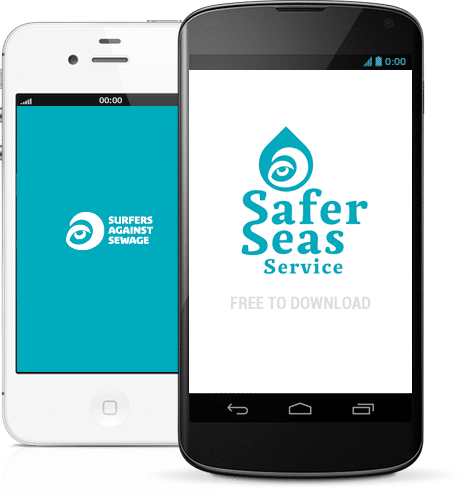 The SAS Safer Seas Service is now available as an app to download for free on your iPhone or Android smartphone!